Șumuleu Ciuc is the most important pilgrimage place of Transylvania and of the Hungarians. Since 1959 Șumuleu Ciuc is administratively part of the town of Miercurea Ciuc. It is the famous Virgin Mary shrine of the Catholic Szeklers, as well as a pilgrimage place and the intellectual center for many centuries. The famous Șumuleu Ciuc pilgrimage takes place here at every Pentecost. The Șumuleu Ciuc pilgrimage is the oath-bound event that had begun in 1567,a piety for their Catholic faith, which since 1990 has outgrown to be the most important Christian event of all Hungarians. The pilgrimage is organized by the Hungarian Catholic and Christian believers every year at Pentecost with the participation of many 100 000 souls in the Pilgrimage Church of Csíksomlyó and with an outdoor mass at the nearby valley between the two mountains of the Small and Big Șumuleu. 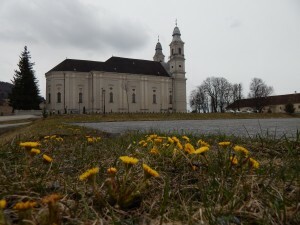 The Pilgrimage Church was built between 1802-1824 in baroque style, the arrangement of its inner space took 72 years. The sculpture of Madonna is a masterpiece of the 16th century wood-carving, which may have been made between 1515-1520, and it is the biggest sculpture of Madonna sculptures of those times. In the monastery next to the church there was secondary education even in 1630. Today`s monastery was built between 1773-1779, its library is containing many cradle-books, original book prints. The Mikó Castle is one of Miercurea Ciuc`s architectural sights, which was built in a late renaissance style. The building of the castle with Italian bastion was begun in the spring of 1623, and it was rebuilt between 1714-1716. Taking away small periods of time when the castle was being used by different institutions, the army used it continuously until the middle of the 20th century. After a bigger restauration in 1970 the Szekler Museum of Ciuc is hosting the building. The museum as a self sustaining institution was assigned in 1950, it inherited the archives of the 30s and the collection with museum character of the Catholic Gymnasium. The Saint Anne Lake is one of the most attractive natural sights of Szeklerland, it is situated 55 km from Miercurea Ciuc. 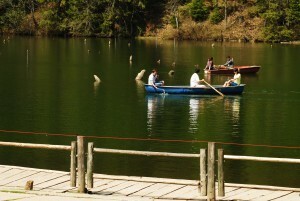 The lake was formed at the bottom of the only intact volcanic crater of Middle-East-Europe, in one of the twin craters of Csomad Mountain, which is part of the southernmost volcanic chain of the Harghita Mountains. The other crater is filled by the Mohos peat moss. Its water surface is about 950 m above sea level. It is part of the Mohos Natural Protection Area. Situated 24 km from Gheorgheni, the Red Lake (in Hungarian Killer Lake) is one of the most beautiful gate lakes of Transylvania, it is situated at 983 meters above sea level. The lake appeared as a consequence of terrain sliding in 1837, in an enclosed valley. 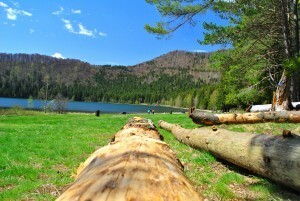 In the lake the fir trees had conserved. The name comes from a folk tale, according to which in the water, which erupted very suddenly, there died flocks and shepherds. The Bicaz Valley is the longest and most beautiful canyon valley of the Eastern Carpathians, with a 5 km length. The gorge was excised by the waters of Bicaz River and it serves as a passageway between the Romanian provinces of Moldova and Transylvania. The Bicaz Gorge is one of the main rock climbing sites in Romania. The almost vertical chalk cliffs are 200-300 m high.